M. David Merrill has been active in the field of instructional technology for almost 40 years. His contributions range from basic instructional principles and instructional design theory to development and implementation of learning environments. Innovations in Instructional Technology is a collection of original essays written by leading scholars and practitioners who have worked with and been inspired by Professor Merrill. The chapters in this book represent a sampling of key innovations in the instructional technology field and include knowledge of how people learn, how people solve problems, how designers conceptualize learning spaces, how teachers implement learning activities, and how evaluators assess outcomes. *three chapters on instructional design practice. The book concludes with a chapter outlining Dr. Merrill's responses to challenges, comments, and questions on the future of the field--ranging from the notion of initial passions with regard to instructional technology to connections between theory and practice to questions of conscience--from an expert panel comprised of many of the contributors to the book. As Dave Merrill's work will continue to be required reading for students of instructional technology, Innovations in Instructional Technology is a book that will appeal to students, researchers, and practitioners in the field. Contents: M.P. Driscoll, Foreword. J.M. Spector, C. Ohrazda, A. Van Schaack, D.A. Wiley, Preface. J.M. Spector, Innovations in Instructional Technology: An Introduction to This Volume. D.A. Wiley, Learning Objects in Public and Higher Education. T. de Jong, W.R. van Joolingen, K. Veermans, J. van der Meij, Authoring Discovery Learning Environments: In Search of Reusable Components. Kinshuk, T-y. Lin, A. Patel, Supporting the Mobility and the Adaptivity of Knowledge Objects by Cognitive Trait Model. J.J.G. van Merriënboer, E.W. Boot, A Holistic Pedagogical View of Learning Objects: Future Directions for Reuse. N.M. Seel, Designing Model-Centered Learning Environments: Hocus-Pocus or the Focus Must Be on Locus. D.H. Jonassen, Problem Solving: The Enterprise. A.S. Gibbons, E.K. Brewer, Elementary Principles of Design Languages and Design Notation Systems for Instructional Design. L. Marshall, H.F. O'Neil, A. Chen, M. Kuehl, I-L. Hsieh, J. Abedi, Teamwork Skills: Assessment and Instruction. W.R. Foshay, D.W. Quinn, Design Science as a Frame for Evaluation of Technology in Education and Training. R.C. Richey, Validating Instructional Design and Development Models. S. Dijkstra, Cognition and Instruction Design for Problem-Based Learning. C.M. Reigeluth, New Instructional Theories and Strategies for a Knowledge-Based Society. R.D. Tennyson, Learning Theories and Instructional Design: A Historical Perspective of the Linking Model. B.G. Wilson, Foundations for Instructional Design: Reclaiming the Conversation. A. Rossett, D. Papaila, Instructional Design Is Not Peanuts. J.J. L'Allier, Confessions of a Practitioner. A. Van Schaack, C. Ohrazda, The Role of Mentoring: Slaying Dragons--An Interview With Dr. Merrill. M.D. Merrill and Colleagues, Epilogue: Questioning Merrill. "This edited volume was compiled in honor of M. David Merrill by distinguished scholars from the instructional design and technology research and developement community who have benefited from his mentoring." "Not only has [M. David] Merrill's own work had a tremendous impact on the instructional technology field, so has the work of his students and their students. This volume is proof. 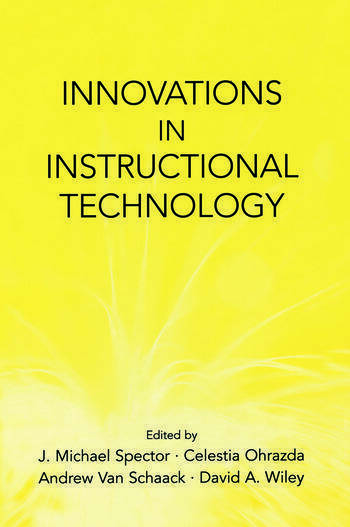 It contains innovative work in educational technology and instructional engineering from distinguished scholars who are former students and colleagues of [Dr. Merrill's]..Dave Merrill has helped to lay the foundation of the instructional design field, and the chapters in this volume now build on this foundation to advance us in new and promising ways."